I first saw Once Upon A Time In China many, many years ago in a small, cold, ratheruncomfortable art theatre. I saw it as part of a double feature with another Jet Li film,New Legend of Shaolin, and it is certainly one double feature I'll never forget. Directedby the amazing Tsui Hark, OUATIC raised the bar for the epic, period martial arts film inHong Kong. Though these films were always very popular in China, it is rare to see films thatgave such lavish focus to the art of filmmaking, not just the elaborate fight sequences. 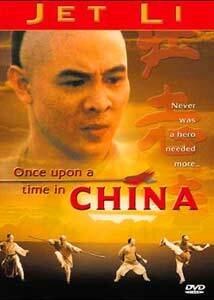 Once Upon A Time.. is one of the numerous Hong Kong films dealing with Chinesefolk-hero Wong Fei Hung. Over 100 Wong Fei Hung movies have been made in China since theearly 50s, when cinema really kicked off there. In this film, real-life martial artist Jet Li assumedthe role of the character. In the reality of the late 1800s, Wong Fei Hung was a sort of scholarlydoctor who also taught martial arts. He is considered a hero to many Chinese people because ofhis efforts to keep the Chinese spirit alive during a period when Westerners were overtaking thecountry. He also fought to keep knowledge alive, especially the martial arts, which were consideredsomething threatening by most outsiders. His myth has resulted in fictional,adventurous tales of his exploits, much like the Davy Crockett films in the U.S. Beyond the 6Once Upon A Time In China films, Wong Fei Hung is perhaps most rememberednowadays in Jackie Chan's Drunken Master films. In fact, one could argue that were itnot for these films, many younger people in China, outside of Hong Kong, would have no cluewho Wong Fei Hung is. In the story, Fei Hung returns to his home in Canton Province and vows to help end the tyrannythat foreigners are forcing the locals to live under. He soon discovers that things are worse thanhe could have expected. With all the British and American ships docking in their ports, thecultural clashes between East and West are severe, not to mention that Christianity is trying to gain afoothold. To make things worse, a local gang is extorting protection money from localbusinesses. The film's story is somewhat two-fold. The first half of the movie essentially dealswith Fei Hung facing-off with the local gangs who ally themselves with American slave traders,while the second half is based more around a powerful warrior (Iron Robed Yim) who grants hisskills to the Americans as well. While anti-foreigner themes are sort of the core of the rest of theOnce Upon.. series, it is this first film that uses the theme to it's fullest extent, painting aninteresting picture of this period in Canton. The best scene, in this regard, is the film's opening, inwhich Fei Hung presides over a traditional Dragon Dance (designed to bring prosperity and luck),but when they light off fireworks, a nearby French ship fires at them thinking they're being attacked. What easily sets this movie apart from many similar Hong Kong pictures is the level of detail andatmosphere. Director Tsui Hark (A Chinese Ghost Story) has crafted a lavish tale filledwith huge, period-accurate sets and amazing cinematography. The story and drama are framed inthis environment, creating an epic feeling. This, on its own, would probablymake a pretty good movie, but of course we also have the outstanding martial arts work and fightsequences. Jet Li is something of a rarity in Chinese cinema, in that he is a real martial artist whohad won several awards and tournaments before stepping in front of the camera. Even greats likeJackie Chan are not actually trained in real fighting techniques. For those of you who have onlyexperienced Jet Li in films like Lethal Weapon 4 or the abysmal Romeo MustDie, this film is simply a must-see. If for no other reason, see Once Upon A Time...as a window into what Hong Kong cinema once was; a home for incredible, epic tales of struggle,helped along by breathtaking martial arts. Though Jet Li makes a fantastic lead, he is backed up by some considerable talent. Chinesecinema legend Yuen Biao co-stars as Foon, the bumbling apprentice to Fei Hung who can neverdecide where to put his loyalties. Despite the fact that Biao is a star in his own right, his role hereis surprisingly tame with only minimal use of kung-fu. Another interesting cast choice was that ofJacky Cheung (almost unrecognizable in make-up) who plays Buck Tooth So, a strictlycomical/dramatic role; something of a surprise given his career in sword-and-sorcery flicks(although he would later fight alongside Jet Li in the outstanding High Risk).Another important feature of this film is that it marks one of the few times that U.S. home videohas actually seen an unmolested version of a Hong Kong film. There is no rap soundtrack addedon, no massive edits, and no awful voice acting. How appropriate for one of the truly greatmasterpieces of the genre. Image Transfer Review: Both versions of the film on this disc (original and the edited, dubbed version) look pretty awful. There's no way to dance around it. There's severe edge-enhancement problems, adding anartificial type of aliasing distortion to the image and a blooming effect to just about everything inheavy light. The picture is extremely blurry and very grainy. Unfortunately, this particular print isfrom Media Asia and NOT Tai Seng; Tai Seng's version is much better. You can watch thefilm, but the image quality is appalling considering the beautiful photography. I canonly hope these Hong Kong titles get revisited and made into significantly improved versions. Ifthere's an upside, it's the fact that the source prints do NOT contain the original subtitling. This isa good thing, because the original, hard subtitles were not only really bad (things like "He sayyou be going! "), but also featured an additional Chinese subtitle track (for those who could notunderstand the dialect). Now we have player-based subtitles that, on a 4:3 set, are under the2:35:1 image frame. I get the feeling that despite the anamorphic enhancement, this movie wouldactually look worse on a widescreen TV. Audio Transfer Review: Despite the elaborate visual fantasies that Hong Kong cinema often paints, the soundtracks forthese movies are usually sorely lacking any kind of definition or depth. The mono Cantonese andMandarin soundtracks are livable, but sound hollow and very cheap. There is agreat deal of distortion in the musical portions, and it's all very underwhelming. On the positiveside, I've never heard the film sound any better, on any format. The English dub version is thesame, except with new voices, most of which aren't very good and stand out as pretty goofy. Extras Review: Listed as a special feature, the North American version of OUATIC is on the disc. Thisversion, which was originally shown on television, I cannot honestly recommend. It's not somuch the dubbing as it is the fact that this edited version is almost an hour shorter than theoriginal cut. It removes large portions of the story development and dramatics, and boils themovie down to an absolute minimum of basic story and all the martial arts sequences. Thegrandeur and spectacle of the film is sucked out of this undignified version. If anything ispositive, it's the fact that the voice acting performs slightly better translations of the dialoguecompared to the stiff subtitles. The original, uncut version features a commentary track by Ric Meyers who, among other things,contributes to the great Asian Cult Cinema magazine (which also published a very good book bythe same name). The commentary is a must-listen, as Meyers really knows his kung-fu films,providing the viewer with great insight into the movies, their history, and where they might begoing. He also adds the right amount of humor to the commentary. Some trailers for other Hong Kong releases available on DVD are present, although other thanJackie Chan's Who Am I?, all these films have been badly edited for release here. Thereare some slim, but mildly informative bios for Jet Li, Tsui Hark, and Rosamund Kwan. Thepresentation and cover art works well, but is nothing more than functional. If one were to put all of the Wong Fei Hung films into chronological order, it would be aconsiderable task. Regardless, you don't need to have seen the classic Fei Hung films to enjoy thisoutstanding bit of martial arts expertise, but he poor video quality definitely puts this this in therental-only category, I'm afraid. I can only hope we see the OUATIC sequels here since,even more so than the first film, they are simply amazing. Highly recommended.